An influential group of ancient writings increasingly studied as aids and additions to the accepted canon of Scripture. A decorative finish to the page edges in which a red dye and gilt foil combine to add richness and lustre to the finished volume. Thicker than India paper, but still much thinner than common book papers. Term used to indicate non-lightweight paper. A style of binding in which the back cover is extended in a flap to fold around the fore-edge, snapping shut to protect the gilt page edges. A decorative technique by which the page edges of a hardback book are tinted to reflect the colour of the binding. An alphabetical list of key words that can be used for locating a Bible quotation or identifying related material. It catalogues the places in the text where significant words may be found, with their chapter and verse. A system by which verses which have a similar wording or theme are linked throughout the Bible. They may be located in the centre of the page or at the margin. A decorated page bound into a Bible or prayer book on which the owner can record births, deaths, marriages and other significant events in the life of the family. A decorative finishing style in which a gold-coloured metallic foil is applied to the edges of the pages after they have been cut and rubbed smooth. Silver foil is often applied to the page edges of volumes bound in white. See also art-gilt edges. A plain gold line or 'frame' on the inside covers. A decorated page bound into a Bible or prayer book on whichto inscribe the name of the giver of the book, the name of the recipient and the date of the gift. Some Bible texts incorporate a phonetic system for indicating how to pronounce difficult names, showing the vowel sounds and stressed syllables, as in a dictionary. These volumes are sometimes called 'self-pronouncing'. Bibles in which the words of Christ are printed in red, a practice introduced in 1899 by the American publisher Dr Louis Klopsch. 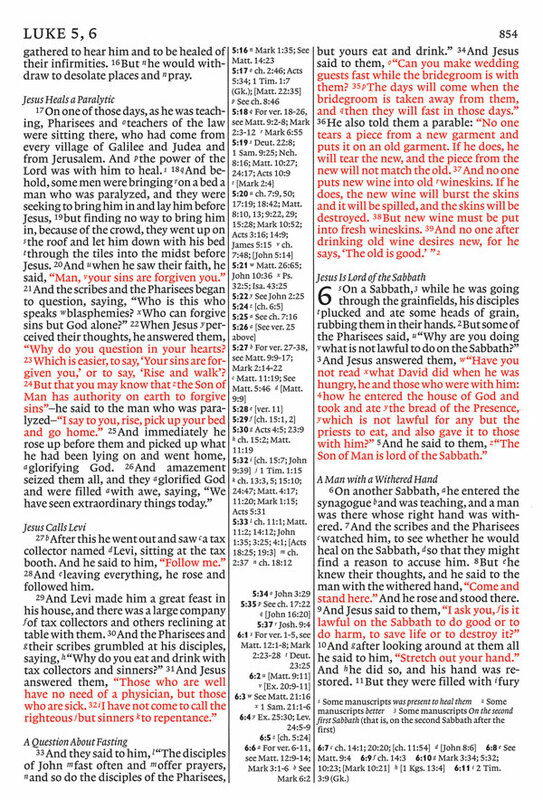 In Cambridge KJV Bibles, the direct speech of Christ whilst on earth is printed in red. Other publishers include indirect speech, e.g. the words at the beginning of Revelation. Thumb indexed editions have semi-circular cuts made by hand in the outer margins of the pages. The abbreviated names of the books of the Bible are stamped on small tabs, which are firmly glued on to the first page of the individual books, to enable the reader to find the page quickly. A zip sewn into the edge of the cover that may be closed to protect the gilt edges.